@dr0w I don't know if disabling the SIM is possible... or do you mean the data connection per SIM? I've come to the conclusion that Indicators ought to be a way of getting to do the common, important things, like calling/texting, listening to music and scheduling quickly and easily. And I think a comms indicator would do just that. Fair enough, @cibersheep - mine's completely empty. 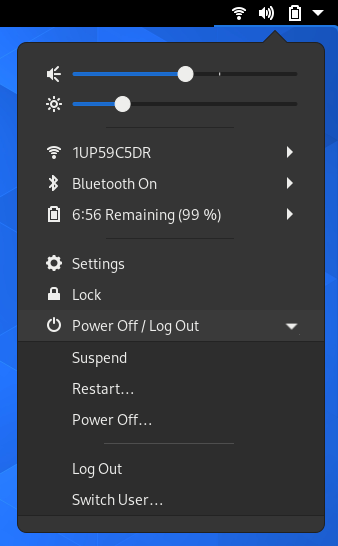 Is the pop-up design language of GNOME, with a flattened palette, preferable to a pull down screen? @dobey I don't understand exactly what you mean: a single panel but with more things/options that on android or a few panels but that groups things together? imho there are too much indicators and scrolling through them sometimes is a bit long. to switch it off just use the switch inside the indicator. @mymike A single panel which has a few items, and notifications perhaps. A panel that is more convergence friendly. Anything that requires swipes only to work, is not a good solution. @dobey I'm comming back from my mum's. I have used the indicators from GNOME now. Calendar is as busy as our calendar indicator though. The thing I don't like and it's similar to Android is you need to tap on several areas to expand the menu. And the GNOME indicator shows a lot fewer options that in UT. And this is what UT is much better at, accessing to several indicator in a very simple and direct way. @cibersheep Yes, I am not suggesting we do an exact clone of GNOME or Android. There are things I don't like about both as well. But really, there's only so much you can fit on a screen, and having too much settings/information in indicators, is just as bad as having too little, if not worse. @cibersheep well if you need location you need to pull down on network and swipe left as location icon is not shown as it is not enabled yet.